Portainer is a self-hosted web UI. You can use it to view the state of your containers, and interact with them. A UI to interact with your Docker host or Swarm cluster. Or just to get an overview. See how many resources your containers are using. 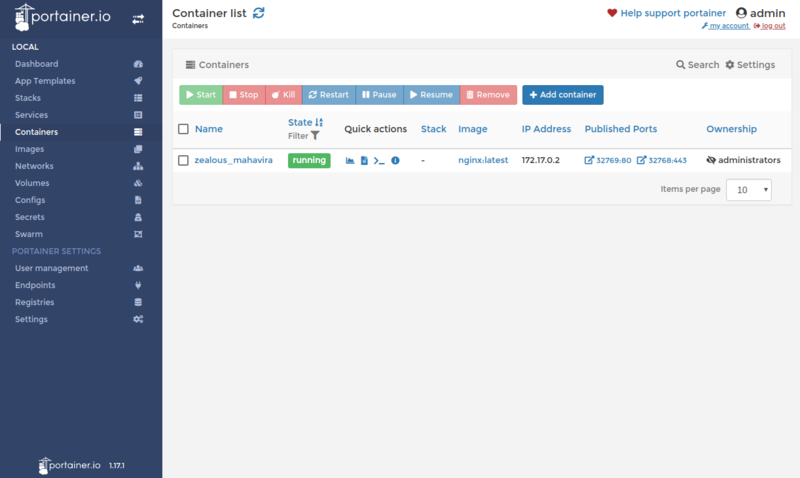 Get details about your Docker containers in a good-looking graphical interface. You like graphical interfaces, and would like to use the Docker CLI a bit less. You are running multiple containers and need to check their status and behaviour. For Docker and Swarm (not Kubernetes). Easy to get started: deploy it in a Docker container. Create users for the interface. See stats around your Docker host, containers and more. Run containers (and stacks) using built-in “app templates”. Run the interface on localhost, and forward the port via SSH, instead of making it available to the whole internet. You can see a lot of the features in screenshots here. You can go to the demo site, enter demo credentials and interact with the tool. Read the instructions here. You can set up something like dockprom to get an overview of your Docker host. It’s a mix of Grafana, Prometheus, AlertManager, NodeExporter and cAdvisor, providing nice dashboards with metrics on your containers. For more options, check out this list of other Docker GUIs.